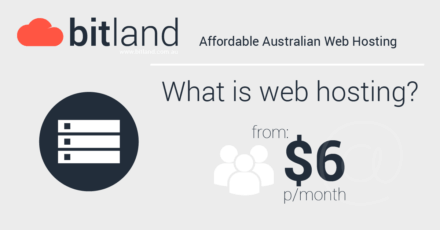 Founded in 2016, Bitland is a new player on the Australian hosting scene, offering affordable plans backed by 100% Australian service. With data centers in Victoria and New South Wales and a fully Australian support staff, the company presents itself as the best solution for enterprises that deal mostly with the Australian market. However, most of their packages come with notable resource caps, and are ill-suited for bigger businesses running more complex websites. Lower-cost plans also come with a lower uptime guarantee than the industry standard. Still, if you're planning a relatively simple website and like the flexibility of monthly billing, give Bitland a try. Bitland gives you three packages under its Standard shared hosting category, all of which deliver decent features at impressively low prices. Each plan comes with cPanel control panel software, so you can count on an easy-to-use dashboard that lets you manage all aspects of your account with ease. You’ll also get the Installatron script installer, so you have access to hundreds of popular web applications, from CMS like WordPress and Joomla to e-commerce tools like PrestaShop and Magento. All of these are ready to be deployed with a few simple clicks, saving you time and effort. Bitland assures you of free email accounts with every plan, but that perk is unfortunately offset by the resource caps that you’ll also be getting. While Bitland beats out many competitors in terms of price, it loses ground when it comes to resources. You can find providers that will give you unlimited bandwidth for lower than $23 a month, for example. With those storage and bandwidth caps, you’ll have a hard time running more complex websites, especially sizable e-commerce ventures. Bitland’s Standard hosting plans are best used for personal-use websites, or relatively static sites that don’t need to perform complicated operations regularly. If you need more resources, consider going for Bitland’s Premium packages instead. You get the same set of features as the Standard plans, with cPanel and Installatron as the centerpieces of the list. You’ll also get the same ability to switch between plans as needed, plus freedom from restrictive long-term contracts. Unlike Standard subscribers, you’re guaranteed priority support from the company’s technical staff. However, Bitland doesn’t go far beyond these typical features. While you might be saving in terms of financial cost, the relative lack of additional features puts Bitland at a disadvantage compared to other providers that often deliver richer packages for an acceptable bump in price. That disadvantage grows when you consider the resource caps that come with each plan. While the highest-priced Premium plan gets unlimited bandwidth, for example, it’s still stuck with a paltry 25 GB of storage that is unlikely to cut it for larger enterprises or sites that depend on extensive databases, file collections, or inventories. Bitland gives you four different SSL certificates to choose from, depending your budget and your website’s needs. Trustwave domain-validated certificates, for example, are the cheapest options at $22.50 per year. Aimed at smaller e-commerce sites, these certificates guarantee airtight encryption for their visitors’ personal data. Trustwave Premium SSL certificates, meanwhile, cost $84 per year, cover one domain name, and include a dynamic security site seal. For larger sites spanning multiple subdomains, Bitland offers you the Premium Wildcard SSL certificate instead. Costing $193.05 per year, the certificate nonetheless streamlines security and saves you money by using a single certificate to cover complex websites. For top-quality site certification, you can pay $232.20 per year for premium EV SSL certificates, instead. With enterprise-grade Dell servers equipped with SSD storage, Bitland promises you snappy performance and site loading times across the board. The company also emphasizes its Australia-based data centers, which means you won’t have to worry about data vulnerabilities and latency issues arising from offshore operations. You can select which data center location (Melbourne or Sydney) works best for your audience, too. The company gives Premium subscribers a 99.9% uptime guarantee, which is pretty standard for the web hosting industry. Disappointingly, Standard subscribers only get covered for 99.5% uptime. Bitland aims to give its customers greater flexibility when it comes to their hosting choices, and that means there’s no attempt to lock you into years-long contracts. Instead, you can choose to be billed monthly or annually, and you’re free to switch plans or cancel your account at any time. Bitland provides 24/7 support through email and support ticket, with phone support also coming soon. Premium plan subscribers can count on priority responses, too. There isn’t a comprehensive knowledgebase available, but the company does post helpful articles on its blog. What's the Verdict on Bitland? Having just entered the hosting business in 2016, Bitland is one of the newest Australian hosting providers out there. The company prides itself on offering flexible and affordable hosting options, and you’re certainly getting that with their Standard and Premium packages. However, the accompanying resource caps might prove too restrictive, especially if you’ve got a thriving, high-traffic website. Bitland works best for budget-conscious site owners who need a no-frills and cost-effective hosting solution.